When I started this story, I wasn’t sure what to expect. We’d already gotten all that shock and awe of the tragedy in the first book and I didn’t know where Rebecca’s story could really go. It went somewhere I never expected and in the end what a beautiful story it was. Wes has hit bottom and has no clue whether he can ever be on top again. When another scary situation confronts Rebecca, Wes is there to try to help her. He has no way of knowing who she really is and fireworks definitely go off for these two but not necessarily the good kind. This story has some signature Roni Loren steam and some angsty moments but it also carries a really important message. Maybe more than one. No matter where you are in life, things can still get better. Trust those who believe in you, trust in yourself, trust your gut and accept help when it is offered. Rebecca will learn to love herself again after so many years of guilt and seeing this strong woman let down her walls to let others in is beautiful and makes her infinitely stronger. 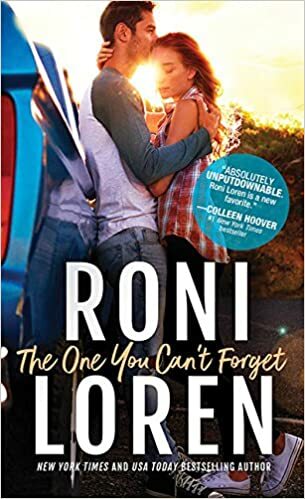 As someone who doesn’t read much mainstream contemporary romance, I was hooked by the blurb for The Ones Who Got Away. This series features the survivors of a school shooting, more than a decade later, learning to deal with survivor’s guilt and move forward in their lives. While I suggest reading the first installment in the series, The One You Can’t Forget could easily be read as a standalone. First and foremost, I need point out how this is not fluffy but it’s also not nail-biting emotional stress, either. While Rebecca is suffering from PTSD, survivor’s guilt, and shame for her behavior back in high school. The emotional gut-punch rides just beneath the surface. Not too light. Not too heavy. Perfect for a wide array of romance readers who need a realistic portrayal. The novel starts out during another traumatic time, one that freezes Rebecca. To the rescue comes a stray dog and a down-on-his-luck chef. Wes brings that delicious angst that romance reader eat by the spoonful. Brooding, wounded, yet a man driven to make his dream reality… and Rebecca is the lawyer who single-handedly took his dream away. Wes and Rebecca shine the most bantering during the getting-to-know-you stage of their friendship. They’re drawn together, even with this being their second chance after a not-so great first impressions. Another layer of angst is Rebecca’s perfectionist, controlling, smothering politically minded father. Wes teaches underprivileged kids how to cook, and this draws a dark and gritty reality how many youths who are forced into crime to survive. Why 4 instead of 5 stars? When I compare the first book to the second, my feverish need to click the pages wasn’t there. I wasn’t as emotionally invested in Rebecca and Wes. The first felt inspired, and this felt as if it was Rebecca’s turn for a book but there was something missing- a flatness, fill-in-the-blanks feel. The specific characters, the angst, and newness of the first installment hooked me more, resonated with me. I did have a difficult time connecting to Rebecca or Wes. While realistic, I didn’t think Rebecca self-sabotaging or spineless, so the conflict that arises didn’t fit the character. I was satisfied and happy at the 60% mark of the story, and felt it meandered and created manufactured conflict to rush toward an ending. Highly recommend, I’m more than eager to read the next installment.